The first three frigates for Russia's Black Sea Fleet will be built at the Yantar Shipyard in the Baltic exclave of Kaliningrad, a shipyard spokesman said. Yantar won a tender to build three Project 11356 frigates last week, Sergei Mikhailov told RIA Novosti. "The construction of the frigates for the Russian Navy will be carried out in parallel with the construction of the same-type frigates for the Indian Navy," Mikhailov said. Yantar is currently building three Project 11356 frigates for the Indian Navy under a $1.6 billion contract signed in 2007. 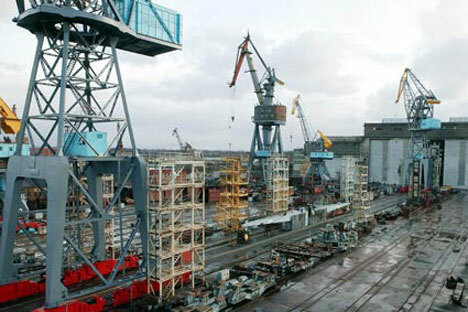 The first warship, the Teg, which was floated out last November, will be handed over to India in mid-2011, Mikhailov said. The second, the Tarkash, and the third, the Trikand, will be delivered in 2011-2012, he added. Russia has previously built three Talwar-class frigates for India - INS Talwar (Sword), INS Trishul (Trident), and the INS Tabar (Axe).